I’ve mentioned on a few occasions that I’m loving the Olympics. In fact, my whole family is enthralled with the events. 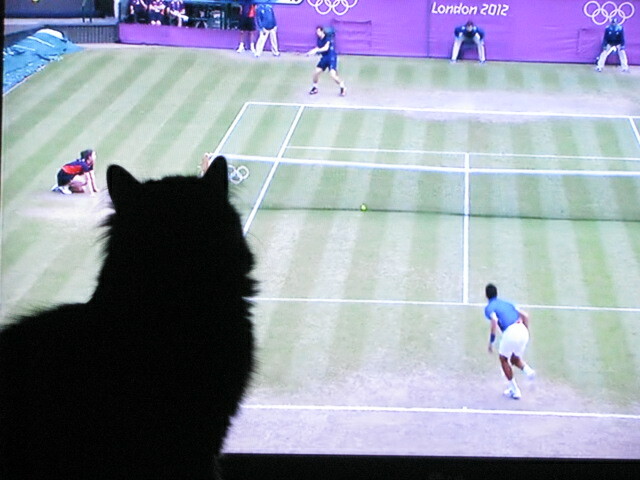 Here’s my cat, Atticus, watching tennis on the telly. I think I need to take him to the optometrist since he gets right in front of the TV to see all the action. 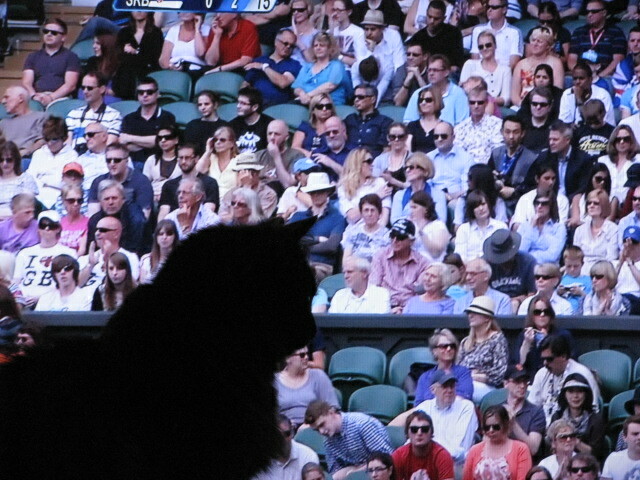 This entry was posted in Sports and tagged 50 Year Project, Animals, Cats, England, Humor, Life, London 2012, London Olympics, Olympics, Photography, Photos, Sports. Bookmark the permalink. Our dog loves to chew on tennis balls. I know. I’m not sure how I’ll handle it. Thanks Susi. I’m happy that he’s a sports nut as well. Our dog does too. His ears perk up and he really concentrates on the screen. It must be the noise. His cute factor lets him get away with a lot around here. Haha it’s the same with my dogs, they get away with a lot since they’re cute. He is very special to us. Thanks Nia. You are all watching the TV so why can’t Kitty Cat! Adorable! I don’t mind his watching, but he has a habit of blocking the part of the screen that has the most action. His timing is perfect and I missed many of the good points. Oh, I’ve been there. It’s amazing what we do for our animals. Just don’t let him get this carried away…imagine watching the shotput…. That is just too cute. Atticus needs to pick up his game. He just watches. We’ve had boxing on lately, but he doesn’t show any interest. Too cute! Maybe your kitty can get those cat’s eye contact lenses. Surely that’s why they make those, right? I’m trying to picture putting in the contacts. He’s a fighter when he wants to be. I think he would look adorable with glasses. Not sure how I would get them to stay on. That’s cute. I should see if Atticus would react. Cats are characters! Sometimes he gets super active, but it is in short spurts. Thanks, he’s named after Atticus Finch in To Kill a Mockingbird.